I love social media, there is so much good on it but lets face it, there is also a lot of negative stuff out there too. Lately there has been a lot of negativity surrounding bloggers, blogger bashing has been rife and the old chestnut of SPOILER REVIEWS! So lets talk about it a bit, strap in guys this could get long! So, why so much hate for bloggers? The thing I hear over and over is "I want to hear from REAL READERS, not bloggers!" So I will address this first and why it causes upset. We ARE REAL READERS, we are real people, we have lives, families, jobs, pets, obsessions but when anyone is called fake, and repeatedly so, it does get upsetting as we are human beings. I think the problem is some people confuse book bloggers with say life style bloggers, beauty bloggers and the like who DO GET PAID to do reviews, book bloggers do not. There are a handful of book bloggers out there who charge, and some do so underhandedly which is always wrong. If you are paid to review something, you need to declare it. Some authors are still getting caught out with this, over at Book Connectors (a group for authors and trusted bloggers), one of our members, the lovely Amanda from Go Book Yourself created a logo (see on the left hand side). 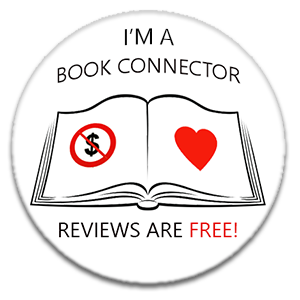 We do what we do because we love books, reviews are honest and FREE, please do not pay for reviews. I think maybe the confusion is they think we get paid so we must be lying, or they only see the books we love so assume it must be a lie? Trying to engage people about this is frustrating because certainly on Facebook the most vocal wouldn't engage in the why. As BT used to say, it is good to chat and the best way to get to the root of a problem is to gab, communicate, talk, some of my fav things! So what is a Book Blogger? A book blogger is a real reader, a person who loves reading but where some readers would read a book and move on or tell a friend over a cuppa, a book blogger will write about it, shout about it on their blog, tweet etc. Now here is where we differ a wee bit, some book bloggers only post about the books they love on their blogs, I tend to do all of mine. A lot of book bloggers got into blogging for different reasons, for some it is a hobby, some to keep tags on what they read, some it has helped with social/health issues. We all blog for different reasons and that is ok, some will only blog the books they loved and again for different reasons. Yes they read books they didn't like and some may still rate them on Goodreads, some will just delete them from their shelves. Some feel that an author has spent so long writing a book they have loved they can't bring themselves to say anything if they can't say anything positive and that is ok too. Me and mine is a wee bit different. I try to review all the books I read and if it is a review copy I feel I owe it to the author, if I DNF (did not finish) I now private message publisher or author instead of reviewing a book I didn't complete. I used to review absolutely everything, even DNF books however after many debates, chats, discussions I no longer do. I once was party to a chat with authors who said they gave out over 300 copies (downloads) of their books out to readers for honest reviews and got a handful of feedback, reviews and the silence was the worst. Had folk hated the books? Downloaded but not got to yet? (review piles easily get into the hundreds) Was it not for them? Silence they can't work with and I personally think all reviews have their place, excluding trolls, author bashing and spoiler reviews (I will come back to them!). If you are constructive, most authors are happy to have feedback, something didn't work for you, why? It is ok to not all love the same thing, we never will, even classics, well known authors, masterpieces have critics and low ratings because even if you are Picasso you will never please everyone, ever! However, it doesn't hurt to be polite, I do reviews from 1-5 star ratings, I make sure authors read my review policy before asking for a review. I will always be honest in my reviews and what doesn't work for me can be hugely popular for others. But I would never bash an author, no one should, you are not what you eat and an author is not what they write. Whilst I think everyone should be allowed to review a book how they feel slagging an author and questioning their morality because they write horror or graphic scenes/books is unacceptable. Be honest not rude. And now, the SPOILER REVIEWS! Oh guys it doesn't matter if you are "just a reader" or "just a blogger", we are as well to just burn the books to be honest if we are dropping spoilers. I cannot imagine why anyone who loves books (or movies) would do this. Speaking to an author this morning and someone left them a review saying they had seen a spoiler for their book and as a result won't be reading ANY of their books! How horrible is that, for the reader having a whole series or author ruined for them, for the author, having all those weeks/months/years of work ruined because someone decided to giveaway the plot. I was just sitting here eating a plate of leftovers from Thanksgiving when I started reading this post, I couldn't agree more. I am a "small potatoes"blogger, but I enjoy what I do and I NEVER bash an author. Nor do I do Spoiler ALerts. It certainly is not fair to the author. I really enjoyed reading this, I hope it gets the point across to some of these ignorants. I don't know why it seems to be so difficult for everyone to get alone - we're all here because we share a love for books after all! I review all of the titles that I read. I don't author bash, and I NEVER include spoilers. Thanks to all reviewers. t do The odd few and appreciate The Time and effort you dedicate to it. For me a Review Policy is a must if we are to let authors/publishers know what they can expect from us whilst also letting them know what we expect from them. To me it really is a partnership. Very straightforward and relevant post. Shared it, an am following your blog now. Great post. I write reviews on the books I read and I try not to give away spoilers. I enjoy literary criticism to analyze an important novel, but my blog reading has to do with what other readers enjoy reading that I might enjoy, too. My reading habits have changed over the years, and I read for entertainment, love mysteries, suspense, fantasy, and science fiction. I find more about what I might want to read on blogs than anywhere else. Taking money for reviews is awful. I get a fair number of solicitations to take ARCs but I never accept them. I tend not to post about newer books. I would not accept an ARC unless I was one hundred percent sure that I was going to read the book. As you know I tend to blog about older books. I sometimes give a way a lot as I also tend to analyze and discuss rather then do straight up reviews. I do occasionally do this with newer books. I always put up spoiler alerts when I give things away.